Finally, Apple unveiled iPhone 7/Plus with water and dust resistance, A10 Fusion, new "Jet Black" color and more improved features on September 7, 2016. Many Apple fans want to upgrade to iPhone 7/Plus. But, a pain in the neck for majority of new iPhone users to manipulate is the new iPhone setup issues. If you just get iPhone 7 in hand, chances are that you have no idea on how to activate iPhone 7/Plus, let alone how to set up iPhone 7/Plus further. 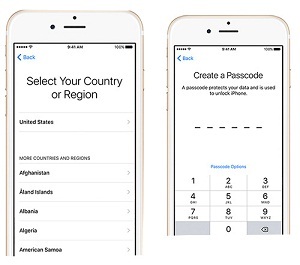 In such case, it's advisable to have a brief stopover on this page, for it will bring you an insight on how to activate your iPhone with or without SIM card. * Get ready for various iPhone 7 problems after your iOS 10 update. If you don't please check all iPhone 7 pros. * If you upgrade your iPhone to iPhone 7, then you need to transfer data from old iPhone to iPhone 7 during the setup procedure. So please make a digital backup of iPhone data file in case of data loss during file transfer process. otherwise, you will download movies to iPhone 7/7 Plus again after iPhone 7 activation, as well as other files. * Please equip with a powerful iPhone 7 file transfer tool, so that you can freely transfer content from iPhone to iPhone 7 or computer to iPhone 7 iOS 10.
iPhone Transfer Tool - MacX MediaTrans helps you transfer videos, movies, music and more from computer Mac/Windows to iPhone 7 iOS or old iPhone 6/6s/SE to new iPhone 7/Plus. Batch transfer, world's NO.1 speed, any format support! • If SIM card is okay, then you can begin the iPhone 7 setup journey. To activate your iPhone 7/Plus on Verizon, you can have three options, Wi-Fi, OTA or iTunes activation. Here we get iPhone 7 activation started with Wi-Fi activation method first. Step 1: Verify the old iPhones are powered off prior to activating iPhone 7/Plus. Step 2: Press the Power button (top-right edge) to power iPhone 7/Plus on. Step 3: Slide from left to right anywhere on the "Hello" screen. Step 4: Choose language and country (or region). Step 5: Opt for a Wi-Fi network to connect. Then make a decision on Location Services (on or off). Step 6: Set up Touch ID and create a passcode (usually six-digit passcode, and Passcode Options gives you more freedom on customization passcode). 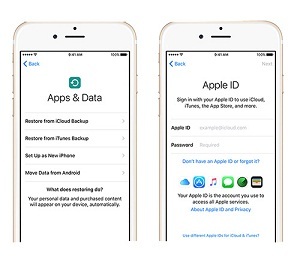 Step 7: Restore or transfer your Apps &data from old iOS devices or Android device. 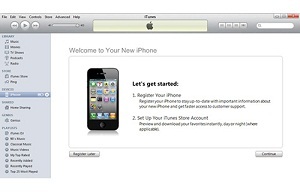 Step 8: Sign in with Apple ID. Followed by iCloud Drive, Apple Pay and iCloud keychain setups. Step 9: Choose one from two: Turn on Siri or Turn on Siri Later. Step 10: Display resolution selection: Standard or Zoomed. Then tap Next to continue. Step 11: Tap Get Started to begin using your iPhone 7/Plus. Note: The iPhone 7 activation process takes 2-3 minutes, and after that you will see the status bar at the top of the screen changes from No Service to Verizon. The same applies to iPhone 8 set up. Step 1: Make a data backup from your old iPhone. You can rely on iTunes to transfer data from old iPhone to iCloud or computer (Mac/Windows PC). Step 2: Access to ATT&T official wireless activation site. 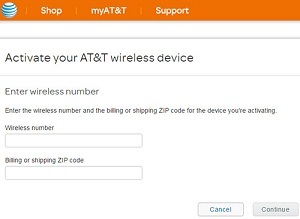 Then enter your wireless number and billing or shipping ZIP code as shown on the picture. Tap continue. Step 3: Turn off your iPhone 7/Plus. About 5 minutes later, restart your iPhone 7/Plus. Your ATT&T iPhone 7/Plus is activated now with only 3 steps. After you successfully activate iPhone 7/Plus with Verizon or ATT&T SIM card, now you can go further step with your iPhone 7/Plus. Make more detailed setups on iPhone 7/Plus. Read on. iPhone 7/Plus Battery Setup-the most convenient way to see how much battery life your iPhone 7 left is to see the battery life in percentage on the top bar of iPhone 7 display. Enter into Settings→tap on Battery→turn Battery Percentage to green color→do same to Low Power Mode if you need to save iPhone 7 battery life. iPhone 7/Plus Do Not Disturb setup-in case you want to shake off the annoying notifications, iMessages, or other distractions, you can resort to Do Not Disturb option. 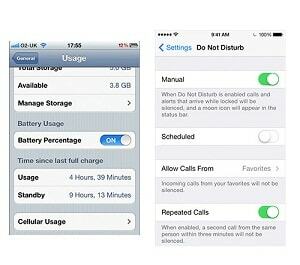 Still in the Settings→scoll down to the second section to find Do Not Disturb (just under Notifications and Control Center)→Multiple choices for you to set up (Manual; Scheduled; Allow Calls from; Repeated Calls; Silence), all depends on your specific needs. iPhone 7/Plus Icons Setup-faced with numerous colorful icons on your main screen, do you feel dazzled now and then? Now share with you a different method to arrange your icons on your home screen-put them in order by color. Constantly tap any one app to start the app wiggle dance, then drag your apps around on each screen to put similar-colored icons next to each other, like blue icons occupy zone A; read icons take over zone B, etc. iPhone 7/Plus Ringtone Setup-the common iPhone ringtone setting method is dead easy. 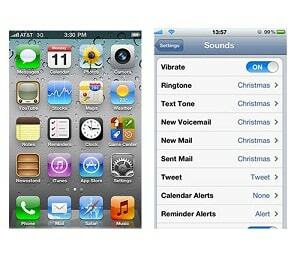 Go to Settings→Sounds→Ringtone (telephone ring, text ring, E-mail tone, etc.). And if you wanna make more unique ringtone for your iPhone 7/Plus, the free iPhone ringtone app becomes of essence. And the recommendable iPhone 7 ringtone apps include Ringtone +++, ToneCrusher, Myxer Ringtones, Ringtone Designer, etc. >>> wanna learn more about how to set up iPhone 7/Plus, here is the must-read tutorial. Some 7 users may find the videos are unplayable anymore on iPhone 7, especially those videos transferred from Android phone. For successful video playback, you can use MacX Video Converter Pro to convert videos to MP4, MOV, M4V for watching on iPhone 7 hassle-free. 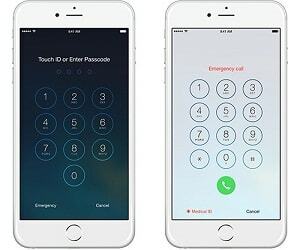 In the below part, you gonna learn how to set up your iPhone 7/Plus without SIM card in two ways: using Emergency calls or iTunes. Step 1. Turn on your iPhone 7/Plus and then click on Home button. Step 2. Resort to Emergency call and give 112 a call. Step 3. Followed by the on-going press on the power button of your iPhone 7/Plus. Step 4. When the pop-ups show, click cancel and end the call. So far, iPhone 7/Plus activation mission is done. Step 1. Free download and install the latest version of iTunes on your Mac/Windows PC. Step 2. Connect your non-activated iPhone 7/Plus to your computer via iPhone 7/Plus USB data cable. Step 3. Launch iTunes on PC and do what the instructions ask you to do after the instructions shows up on the screen. This is the common method of setting up iPhone 7/Plus with iTunes instead of SIM Card. Face with a lot of problems when and after you set up new iPhone X/8/7s/Plus, such as data loss? Hold on, follow the tutorial about how to activate new iPhone 8 or iPhone X and backup your data before iPhone 8 setup. What are the pros and cons of iPhone 8 and iPhone X? Is the new iPhone worth the awaiting? Check out in-depth iPhone 8/8 Plus advantages and disadvantages review, including iPhone 8 OLED display, fast wireless charging, Face ID recognition, battery drain issues etc. MacX MediaTrans is the best iPhone 7 file transfer with top quality and fast speed. This feature-rich iOS 10/9/8 transfer can help you easily transfer video, music and photo between iPhone/iPad/iPod and Mac.